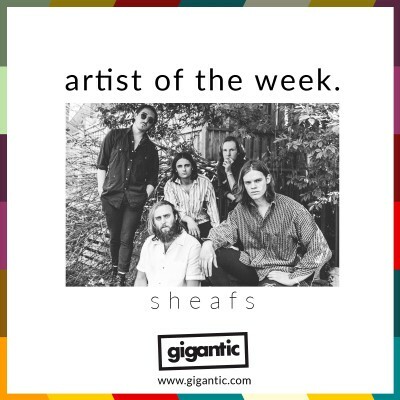 Taking their ques from the lightening fast indie rock the Steel City is associated it with, beefing it up with a heavy swagger and applying a serious amount of attitude; Sheffield quintet SHEAFS are becoming quite the force to be reckoned with. Their band members include drummer Charlie Eastap, lead singer Lawrence Feenstra, guitarists Chris Goodacre and Charles Mellor with Callum Wright playing bass. Formed towards the latter months of 2015, SHEAFS quickly asserted themselves as an incendiary live band and within two years had already produced two crucial singles; ‘Mind Pollution’ which sees the South Yorkshire squad rapidly riff at a frenetic pace for three and a half minutes while Feenstra lambasts those who have fallen under the control of societal vanity and their sardonic song ‘This Is Not A Protest’ which takes a swipe at soulless music and has become a live favourite with fans often attending their sets with placards declaring the title. The release of these two tracks pushed the band into a higher gear and readied them for 2018 which has seen them accelerate their growing attention and become a major name across the UK and beyond. This year has seen SHEAFS reach even wider audiences, starting off with their ever tour as the headline act and thrilled audiences at Nottingham, Bristol, Stoke and - of course – a sold out show in Sheffield at The Harley. The tour coincided with the release of their latest single ‘Shock Machine’. Produced by Thomas Mitchener (Gallows, Young Guns, The Eighties Matchbox B-Line Disaster), the song starts with a boisterous groove before creeping into their final approach and a massive finish which always makes for an explosive live performance. ‘Shock Machine’ was quickly seized upon by the likes of Steve Lamacq who featured it on his BBC 6 Music show. Their steep rise continued with the band benefiting from a prominent support slot for seventies inspired rockers Greta Van Fleet as they toured Germany before hitting London’s Electric Ballroom and heading on over to Paradiso Amsterdam. This summer has also seen them appearing at such major festivals as RiZe, Y Not, Tramlines and a returning visit to Truck in Oxfordshire plus supporting vital mod revivalists Ocean Colour Scene at Don Valley Bowl along side the likes of The Coral and The Bluetones to play their biggest hometown gig to date just a few weeks ago! Emboldened from all the excitement, SHEAFS are still hungry for even more and have already announced a major tour to see out the year. Catch them on a stage this November as they prepare for even bigger things in 2019 - and we cannot wait to see what they do next! Sheafs tickets are currently available.